A former top boss of corruption-accused facilities management company Bosasa will deliver bombshell testimony before the state capture commission of inquiry this week. Ex-Bosasa chief operations officer Angelo Agrizzi will give evidence before the commission and is expected to outline a myriad of corrupt activities the company and its directors engaged in over more than a decade to secure multimillion-rand government contracts - and to stay out of jail. Bosasa changed its name last year to African Global Operations. 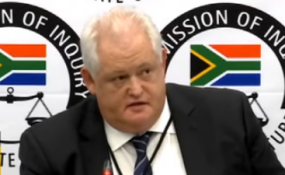 Agrizzi's testimony is set to implicate former president Jacob Zuma, National Prosecuting Authority (NPA) officials, senior government officials and ministers. Agrizzi worked for Bosasa between 1999 and 2017 and has intimate knowledge of how the company improperly secured security, fencing, catering and other contracts from the departments of home affairs, correctional services as well as justice and constitutional development. The total value of these contracts over the years is in excess of R1bn. He is also expected to detail massive bribes paid to correctional services officials in return for securing renewals of the company's contract to supply food in most of the prisons around the country. The network of bribes extends to NPA officials, at least one minister and several members of Parliament. The NPA officials, whose names are known to News24, and which include a former National Director of Public Prosecutions, were allegedly bribed to stymie and delay any prosecution of Bosasa executives and government officials who were bribed. News24 has reported previously how Bosasa lavished gifts and cash on ministers Nomvula Mokonyane and Gwede Mantashe as well as deputy minister Thabang Makwetla and also revealed how top ANC MP Vincent Smith accepted cash for his daughter's university fees from Bosasa. Bosasa also paid the legal costs of disgraced SABC COO Hlaudi Motsoeneng. In 2009, the Special Investigating Unit (SIU) finalised a report that detailed how Bosasa had bribed former prisons boss Linda Mti as well as former correctional services chief financial officer Patrick Gillingham with cash, cars and gifts in exchange for multimillion rand catering and fencing tenders at prisons around the country. The report was referred to the NPA in February 2010, where it has gathered dust. Amid allegations of "political interference" and incompetence the case has been delayed. News24 has previously put these allegations to the NPA officials concerned, who all vehemently denied accepting any bribes. It is, however, questionable how and why the prosecution of those involved in the Bosasa matter has been delayed for more than eight years. News24 reported on the delays and the reasons here. It is understood Agrizzi will now lift the lid on these and other bribes paid to various government officials. Agrizzi, who has previously threatened to go public with the information he had relating to the bribes for contracts, is also expected to detail his own involvement in the unlawful activities undertaken by Bosasa. Two key sources with knowledge of the matter confirmed that Agrizzi is attempting to secure indemnity from the courts in exchange for turning State witness. His testimony is set to be crucial in the prosecution of Bosasa chief executive officer Gavin Watson and former prisons boss Mti, both of whom were found by the SIU in 2009 to have been involved in a bribes-for-tenders scandal. Former correctional services chief financial officer Gillingham is also in the line of fire for the awarding of contracts to Bosasa in 2006 and 2007, in exchange for which Mti and Gillingham allegedly accepted bribes on a monthly basis - this included cash, cars and gifts. Bosasa has previously denied any wrongdoing and maintained that Agrizzi and other former employees were involved in a sabotage campaign aimed at destabilising the company to make it ripe for a takeover. Agrizzi's testimony before the commission - which is likely to mirror his testimony to prosecutors in his attempts to secure section 204 indemnity - is set to be an explosive account of private and public sector corruption.